Synopsis: 'What is it? What does it want? Why is it angry with me?' January 1937. Clouds of war are gathering over a fogbound London. Twenty-eight year old Jack is poor, lonely and desperate to change his life. So when he's offered the chance to be the wireless operator on an Arctic expedition, he jumps at it. Spirits are high as the ship leaves Norway: five men and eight huskies, crossing the Barents Sea by the light of the midnight sun. At last they reach the remote, uninhabited bay where they will camp for the next year. Gruhuken. But the Arctic summer is brief. As night returns to claim the land, Jack feels a creeping unease. One by one, his companions are forced to leave. He faces a stark choice. Stay or go. Soon he will see the last of the sun, as the polar night engulfs the camp in months of darkness. Soon he will reach the point of no return - when the sea will freeze, making escape impossible. And Gruhuken is not uninhabited. Jack is not alone. Something walks there in the dark. Most people will know Michelle Paver for her critically acclaimed series about the stone age, entitled The Chronicles of Ancient Darkness. Dark Matter is her first adult ghost story, and it deals with the timeless human fear of the dark, or more particularly, things that inhabit the dark. It is a vividly terrifying book exploring nyctophobia in a rather different way. Dark Matter is very much more than just a ghost story. The edges of the story touch on love, on companionship and on fear, but primarily on the who. The emotions and the personalities of the characters are fleshed out very well, particularly with Jack, who is a strong but very troubled young man- his motivation to join the expedition is that of escapism- fleeing his dank and miserable life from foggy London. His fears are played on very well, and this novel, as well as being a ghost story, also inherently about Jack testing his emotional boundaries and discovering what, who and why he is. Dark Matter has one of those qualities that many of the best books have: the feeling that, while nothing “special” is happening, one could still read on and be fully engrossed. Dark Matter isn’t about saving the world; it’s about the characters, and more specifically, it is about Jack. Always Jack; it is almost like a character study; like people watching, and thinking making up stories about them – and yet, it is extremely intruiging. It’s not just the characters that are captivating either: the prose is also fittingly powerful, and Paver’s descriptions of the rugged terrain of Gruhuken are faultless. Setting it in the snowy landscape of Spitsbergen creates a stark contrast between the intense and cluttered mind of Jack and the more serene, chilling atmosphere of the snowy surround. This vivid setting really sets the supernatural elements up well. The ghost story element of Dark Matter is extremely penetrative, and very relatable. The fear of dark is a mutual fear for many people, and it is not hard to relate to Jack and be terrified. On numerous occasions Dark Matter is frighteningly scary, and Paver builds the tension throughout the first three quarters of the book before unleashing a terrifying culmination. Of course, it wouldn’t be a Michelle Paver book if it didn’t have any wolves or huskies! The eight husky-dog companions of the expedition are one of the only sources of reassurance throughout the book that everything will be alright. It’s easy to tell that Paver knows what she’s talking about when it comes to dogs- she gives very accurate and believe accounts, and proves that a dog really is a man’s best friend. Dark Matter is an extremely good study of fear, of love and of British life in the first half of the 20th Century. Michelle Paver’s first ghost story is hopefully not her last, as she seems to have a raw talent for writing unputdownable, intense and frightening novels. 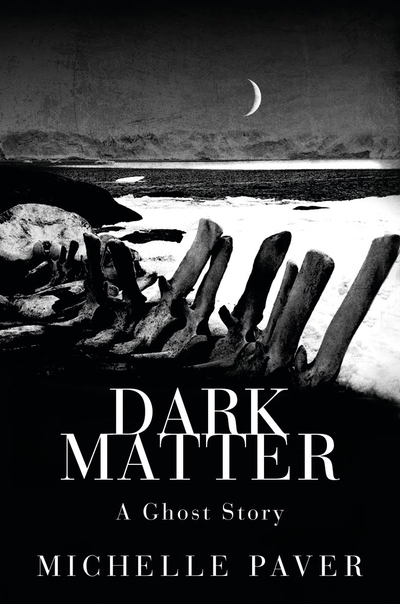 Dark Matter is not a book to be forgotten easily or quickly; it is one that will leave quite an impression for being such an honestly characterised story. What did you think about Dark Matter?